Department. Those who qualified Degree and having necessary physical measurements they can apply online for this HPSC DSP Recruitment 2018 through official website of www.hpsconline.in. Candidates selection is based on Preliminary Exam, Mains Exam and Personality Tests. 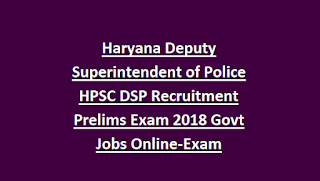 Haryana HPSC DSP Exam Pattern, Prelims Exam Syllabus, Physical tests details are updated below. HPSC DSP Recruitment online applications will be accepted from 02-08-2018 to 04-09-2018. Prelims Exam will be held in the month of September of October 2018. 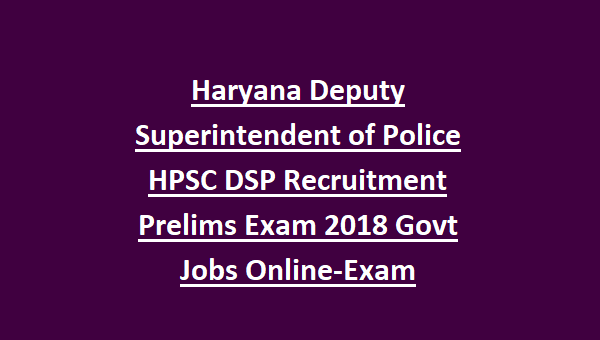 Admit card release date, prelims exam date, prelims exam pattern and syllabus, physical standards and other information about this Haryana HPSC DSP Recruitment 2018 is given below. There is only 7 DSP vacancies in this HPSC Recruitment Exam 2018. Candidates must have qualified Degree to apply online for this HPSC DSP recruitment 2018. Candidates also met the necessary physical standards for this DSP Posts of Haryana. As on 01-01-2018 age limits are 21-27 years for this HPSC DSP Recruitment. For SC and BC candidates 5 years of upper age limit is given. For Ex Serviceman age limits are applicable as per the service rules. Candidates selection for DSP Posts is on basis of Preliminary Exam, Mains Examination and Personality Test /interview. HPSC DSP Prelims Exam consists of two papers. Prelims Exam is objective type only. Candidates who physically fit and having degree qualification they can apply online for this DSP jobs of HPSC through Allied Service Exam 2017. Last date to apply online is 04-09-2018. Official website to apply online for this HPSC DSP Jobs is www.hpsconline.in. Previous Exam Paper, exam syllabus for prelims exam, mains syllabus and exam pattern and other details available in this website only. Admit card for HPSC DSP Prelims Exam will be available 15 days before the exam date.